Welcome back to the Somebody's Story Music with new magic collaboration of two very talented producers from Russia. For whom melancholic music is the mom of happiness. 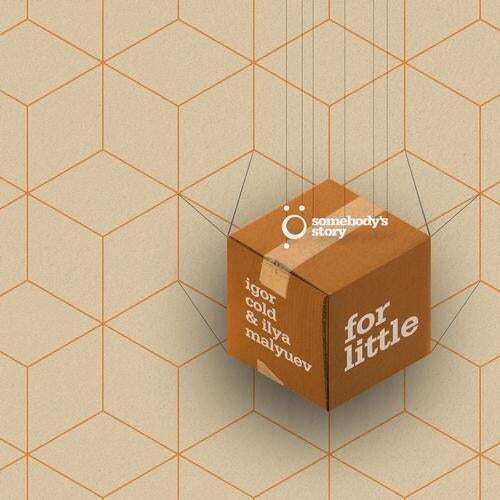 Proudly present you new debut brand release from Igor Cold and Ilya Malyuev "For Little". Two absolutely different versions which are connected with one idea and melody, which will touch the deepest soul strings. Some magic sounds from Igor Cold will appear on techno platform in this EP. Known as space and dreamy music producer, this time he will rock with massive and at the same time beautiful dancefloor track. Being released on Particles with his magic "Motel Dolphin" which was loved by all last fall season and still making fans of dreamy music to fell in love with it. BCSA, Stripped Rec. And now finally on his own SSM label he is demonstrating the power of beautiful music inspiring listeners with crystal sounds. Recent release on DAR label "She So Spacey" which kicked the clubs around the world is the "younger brother" of newcomer Igor Cold's version "For Little". We are keep repeating that our resident Ilya Malyuev is one of the best art-house music producer in Russia. Saint-Petersburg Calling. Hi likes to feed listeners from all over the world with romantic and airy sound stuff which is skillfully coked in his studio. Great start into highest level with giant jump on Armada label with track "Jump The Change". Than walking with confidence he was released on Soundfate where he is the resident with famous Dosem. He regularly shoots with great stuff on Stripped Rec. and Outside the Box. But this time Ilya made magical ambient version in one breath for us. Amazing mood in his version, like a lullaby for the night. Wow! Armed, Birdcage, Hiroyuki Arakawa, NEN, Guy Mantzur, Igor Cold, Tomi Chair, Mig Dfoe, PHM, Poison Pro, GRG, Kaito, DNYO, 100 Days To Summer, Spada, Lanny May, Petar Dundov, Din Mist, Cid Inc.